This vinyl reissue of a year’s worth of singles serves as an ideal introduction to Cold Cave’s icy aesthetic. 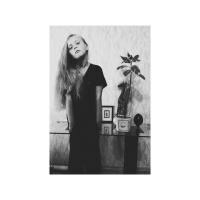 After seeing a CD release last year, Deathwish saw fit to reissue Cold Cave’s Full Cold Moon on vinyl. Regardless of the current trend towards the fetishizing of vinyl, the singles collected here feel largely plucked from another era, one full of primitive, pulsating drum machines and analog synthesizers, and thus ideally suited to the often impractical, though tremendously aesthetically pleasing format. Neither a proper singles collection nor a career distillation, Full Cold Moon rounds up the dozen recordings Wesley Eisold released individually in 2013. Full of primarily minimalist compositions, Full Cold Moon offers little in the way of levity throughout its 47-minute running time. But there are enough hooks and compelling melodic ideas present to help transcend the often same-y feel that afflicts so many darkwave acts who rely solely on buzzing synths and minor key modes to get by. Practically anthemic by comparison, “Oceans With No End” is the collection’s most immediate track. Featuring a driving rhythm and synth line reminiscent of countless early ‘80s gloom mongers, Eisold delivers a series of heart-on-sleeve lyrics in his trademark though somewhat paradoxically yearning monotone. “I thought of you for the first time in five years,” he sings, assuring us he’s made peace with his past and simply wants to know what happened to a long-forgotten friend. “God Made the World” is bleak, autobiographical synth pop with the somewhat meta chorus of “God made the world / but I made this song for you”. Crooning like a gothic Morrissey, Eisold sounds very much of the era he seeks to evoke not only instrumentally, but also philosophically, displaying a sense of vulnerability and hurt that cuts holes in the genre’s nascent nihilism. “Some people lead very meaningful lives / dedicated, devoted husbands and wives,” he sings in a voice saturated with melancholy on “Meaningful Life”. Flipping this, the second verse becomes, “Some people lead very meaningless lives / dedicated to nothing, slaves to time.” It’s a depressing assessment of the black and white terms in which Eisold seems to view human existence. “I want to lead a very meaningful life” he pleads over and over, attempting to reassure himself as much as the listener. It’s a bleak moment on an album full of them, the sadness briefly cut through by a few major key flourishes. The lone white sheep within a herd of black, “Tristan Corbiere,” named for the French symbolist poet who died of tuberculosis at the age of 29, features an Aphex Twin-like electronic fluidity and lightness that stands in sharp contrast to the collection’s harsher elements. It’s a fine reminder of Eisold’s compositional skills often lost within some of his more deceptively basic melodies and chord progressions wrapped in abrasive sheets of sound. Moody, dark and brooding, Eisold’s darkwave gothic minimalism offers a surprising level of personal and emotional detail and depth that helps showcase why he’s held in such high regard. Spanning the whole of his stylistic spectrum under the Cold Cave guise, Full Cold Moon could well serve as an abbreviated retrospective of sorts, pulling in his minimalist darkwave experiments alongside his more overtly synth-pop compositions. For an artist as prolific as Eisold, it’s as good an entry point as any for those looking to delve into the gloomy world of Cold Cave.